25 years ago Disneyland Park opened its doors just outside Paris. 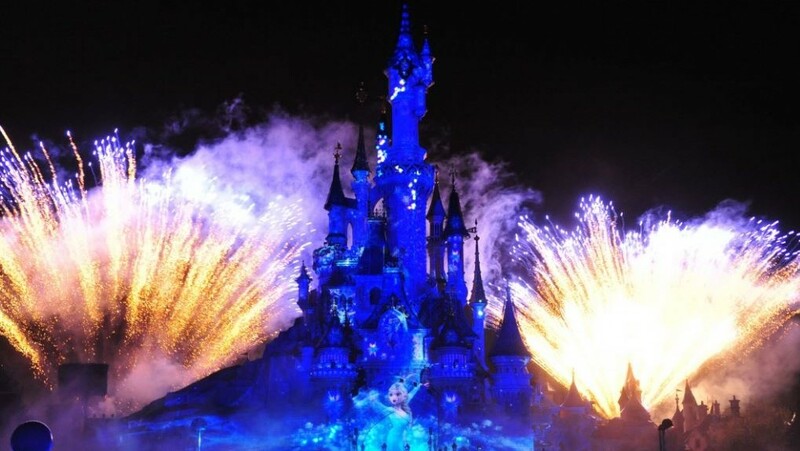 To celebrate this special anniversary Disneyland Paris is introducing a dazzling array of new experiences. Starting 26 march 2017, Mickey and Friends are taking us on a magical journey to the future with two new special Star Wars rides: Star Tours: The Adventures Continue and Star Wars Hyperspace Mountain: Rebel Mission. The festivities continue with a brand new Disney Parade and two new daytime shows which take place near Sleeping Beauty’s Castle. Disneyland Paris also introduces the all-new Disney Illuminations, a stunning night-time finale to every magical disney day.featuring state-of-the-art technology. 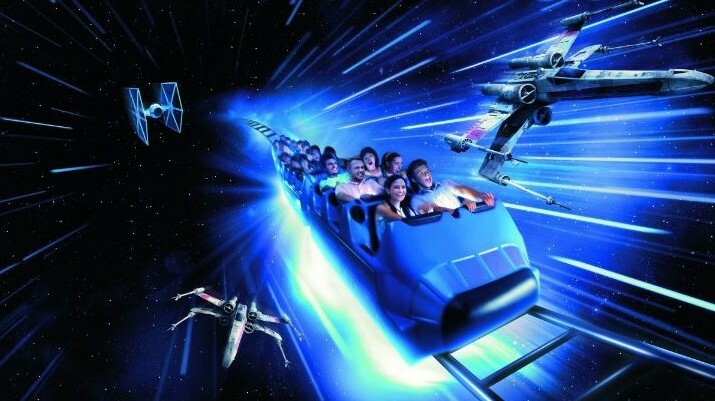 Launched at the opening of Disneyland Park in 1992, Star Tours soon established itself as a cult ride. 25 years later, it’s back with a new experience, new destinations, a new pilot, new characters and new 3D technology. Prepare for lift-off on an all-new, action-packed, 3D intergalactic voyage as Star Tours: The Adventures Continue! Thanks to a multitude of new scenes and more than 70 possible mission combinations, you will never know where the Force might take you. Every ride will offer unique surprises with journeys through the planet Jakku, Naboo, Hoth, Tatooine and more, perhaps even via the Death Star. Guests will travel through the galaxy with a new pilot, C-3PO, meeting heroes they have never encountered until now. Each scenario, journey and unexpected development is random to ensure that travellers enjoy an original experience every time and fully immerse themselves in the universe of the Star Wars films. Visitors to Disneyland Paris will finally get the chance to meet the formidable Darth Vader every day in a new dedicated area near the Star Tours: The Adventures Continue ride. A tip for those who dare to make an appearance: don’t let your guard down when taking photos during the private meet and greet. 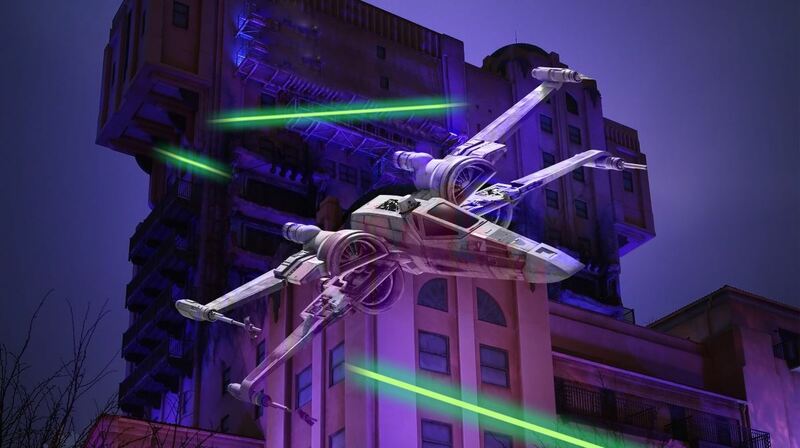 In spring 2017, Star Wars will take over a legendary space-themed ride. Space Mountain will become Star Wars Hyperspace Mountain for a totally unique experience. In a brand new environment inspired by the Star Wars universe, visitors can join the famous Rebel Alliance and become pilots on a sensational mission. They will travel through the Star Wars galaxy at intense speed, to the epic soundtrack of the Star Wars saga. Another exciting journey awaits in the brand new Disney Parade. With dizzying new floats, new music, a plethora of Disney Stars and new costumes, Disney Stars on Parade will dazzle visitors of all ages. In Disney Stars on Parade, Mickey and Friends embark on a real journey of discovery to the land of imagination, divided into eight chapters. Mickey, Minnie, Donald Duck, Goofy and Chip and Dale are explorers of the future… with a steampunk-inspired futuristic look. The heroes of Toy Story are close behind, ready to take us “to infinity and beyond!”! Roar along with Simba to the problem-free philosophy, “Hakuna Matata”! Similarly, Baloo and Mowgli remind us that all it takes to be happy are “the bare necessities”, to the sound of percussion that conjures up a sense of adventure and a jungle atmosphere. Next stop is Neverland with Peter Pan and the Lost Boys! The underwater world is celebrated with Nemo, Marlin and Dory. Listen out for the roar of Maleficient’s majestic dragon form, which challenges Prince Phillip and actually breathes fire. Fortunately, the romance of the Disney Princesses always triumphs over evil. The final chapter of this world of wonder ends as the book closes with an icy blast, thanks to the much-loved heroines of Frozen. The Disney Stars invite everybody to gather in front of the stage at Sleeping Beauty Castle for a huge anniversary celebration, every day of the year. From all over the park, they join together in step until the arrival of everyone’s favourite mouse. To mark this exceptional anniversary, Mickey makes a grand entrance dressed in his smartest outfit: a blue and silver dinner jacket in the celebratory colours. 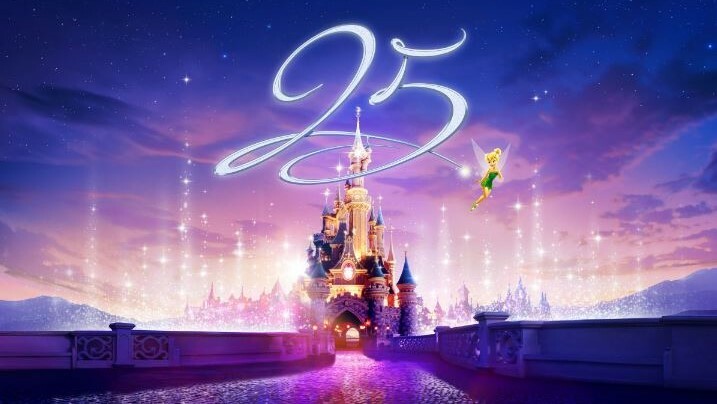 1, 2, 3, 4… it’s time to sing together: “Happy Anniversary Disneyland Paris”! With a sprinkle of fairy dust, Tinker Bell opens the festivities. Aurora invites the other Disney Princesses to the ball: Ariel, Belle, Snow White, Cinderella, Jasmine, Rapunzel and Tiana. Each princess makes her entrance in a magnificent ball gown, specially created for the 25th Anniversary, to the sound of a romantic fanfare. Their message: to remind the audience that every little girl, regardless of her age or background, is a Princess. This show will be enhanced by the spectacular fountains in front of Sleeping Beauty Castle. All these and other new experiences, for the 25th Anniversary of Disneyland Paris, can be enjoyed from 26 March 2017 onwards. Next Azamara Club Cruises introduces Stay Longer. Experience More.